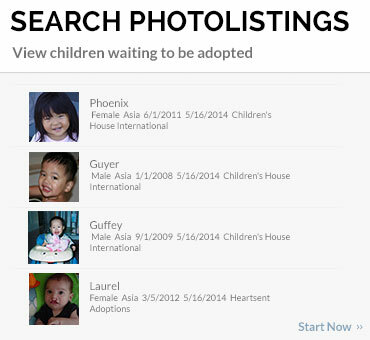 Rainbowkids is excited to share a family journey to adopting a son in 2017. 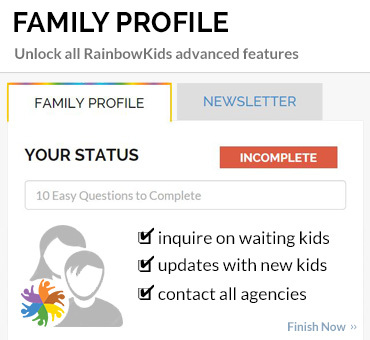 Nancy has agreed to share her adoption story through a series of articles on RainbowKids. 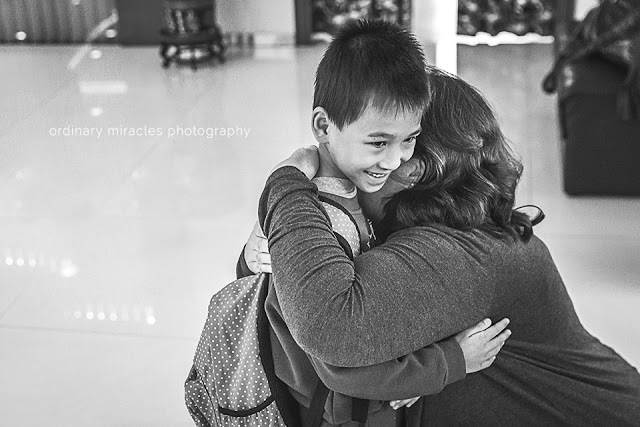 Her blog, Ordinary Miracles & The Crazy 9, documents the daily life of parenting a big family. Through her gift of photography and the written word Nancy captures her growing family through the lens of a DSLR camera. Read her prior posts: It's A Boy! (a.k.a. Why Even is Better Than Odd. Not Really) and The Adoption Process: Patience.Not. 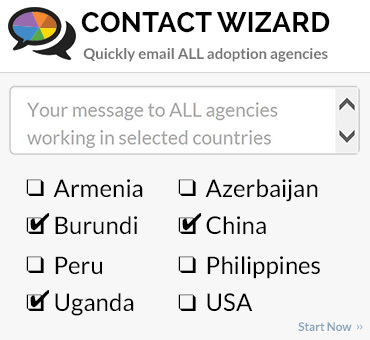 and Artificial Twinning in Adoption: Our "Not Twins", The Reality of What Adopting Looks Like and T-21 Hour and Eyes Wide Open: Traveling to Adopt Ru on Rainbowkids. Okay, I'm not gonna lie. Mostly for the mamas that come after me. I almost started crying on the train ride to Guangzhou. Not the I'm so happy and excited to almost have my son! cry. But rather it was the Oh no, what have I gotten us into? cry. There were some younger children on the train, and I listened to them speak to their mamas during the 2 1/2 hour trip. And it suddenly dawn on me. You know stuff that you already know but you don't really appreciate, and then the reality of it hits you all at once. That happened. Ru won't understand a word of what we are saying to him and we won't understand anything he is saying to us. And despite all that stuff I was spewing less than a week ago, it's gonna be a big flippin' deal! We really won't know each other at all. And yet he's going to be my son in an instant. Tomorrow! And how in the world am I gonna make that all work out without traumatizing him. Or me. Or both! And that's when the mini meltdown almost crying started to happen. I know the anxiety and nervousness I'm feeling is normal. This is a major life-altering event, and it's expected to feel petrified scared a wee bit anxious. It might be kind of odd to nothave these feelings every now and then. 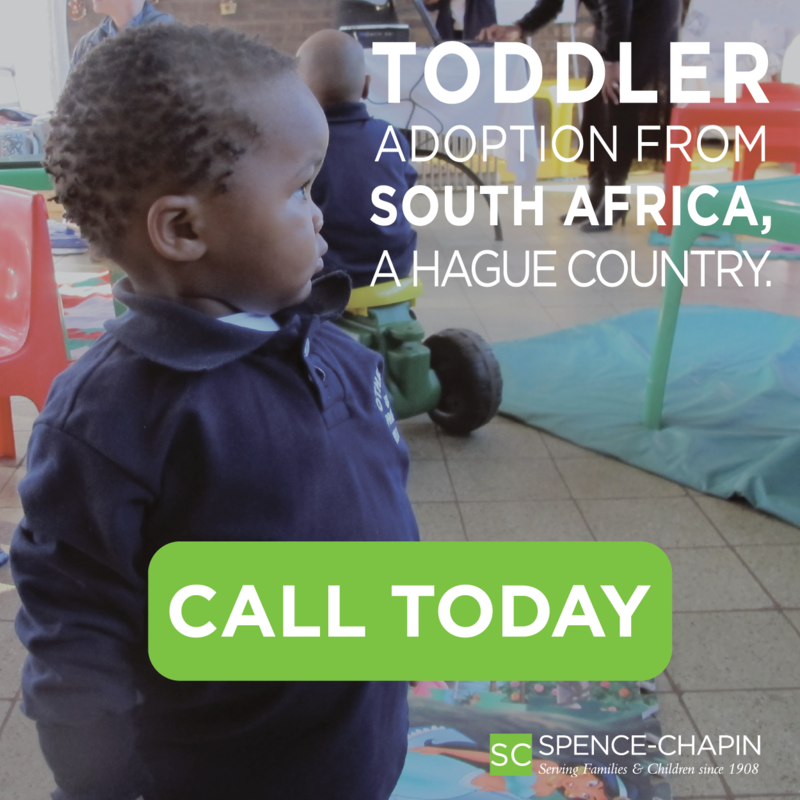 It's just that we have 3 adoptions under our belt already, and I just haven't experienced feelings like this before... till today. And then it also dawned on me, that these feelings are probably very similar to the ones Ru is also likely to be having right now. And I thank God that He gives me the gift of these emotions so that I can appreciate the fear and anxiety that our soon-to-be son will also have. Fear manifests itself in all sorts of ways, including almost crying on trains. I'm thinking that all this waiting with time to think about it all, may be the hardest part for me. Very soon there will be work to be done. The hard work starts and I can do that. The daypacks are loaded. The plan is that tomorrow we meet our guide at 10:00am and head to the bank to exchange the orphanage donation. Then we'll have lunch, and at 1:00pm we meet Ru at the Civil Affairs office, and his whole world will change in an instant. He will enter the building an orphan and exit a treasured son. Long story short, we think we've adopted the happiest boy on the planet. The following is a discombobulated rambling of thoughts about our day not necessarily in chronological order. He was late in coming to the Civil affairs office that we meeting at. We had lots of time to see the other several other families that were getting their children and be witness these amazing family transformations. 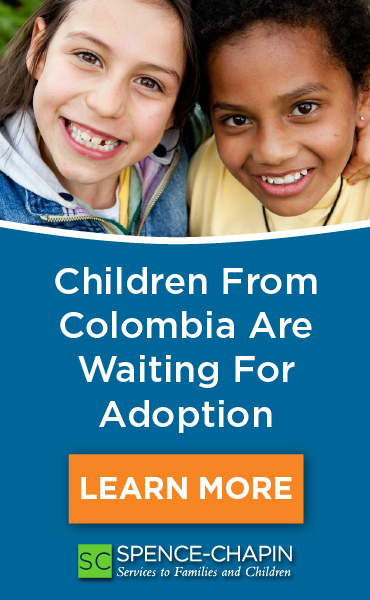 Understandably the children cry and are so upset as they transition to their forever families. Some whimper. Some scream. Some get catatonic. Some keep their new mama and baba literally a couple arm's length away. But Ru was late in arriving from the busy traffic and so we saw him step out of the elevator and right through the doors with a smile on his face. He knew right who we were and walked right up to us. Papa and I got on the ground, onto his level and I offered him a hug. And he came right up and took it! He then walked right over to Papa and did the same, the smile never leaving his face. At first impression seems genuinely excited to be with us, a reaction I was not expecting. But it also seems like this giddy cheerfulness could be a coping mechanism. My gut says it's likely both. Time will tell. 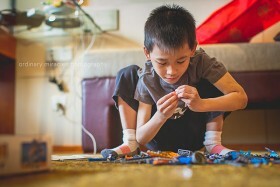 He was evidently given a gift by the orphanage, a huge box of knock-off Legos, and we let him dump the whole box out on the floor since we were the last family there. This boy knows how to follow directions and carefully goes through each page of the Lego directions. He was asked if he liked his new family and said yes! Another thing we noticed immediately is that this boy is definitely on. He go go go go go go go goes. He does have a good attention span, but he likes to play pretty much continually from one activity to the next. Legos, balls, cars, sticker books, cards, more Legos, cars, ball, cars again, how 'bout playing cards and on and on and on... Mimi came up to Papa and asked for a break from it which was absolutely granted thanks to Boo who has already whisked her off a few times from some down time. When we got back to the hotel the first thing he said as he stepped in the door to the hotel room was WOW! He tore through the room checking it all out and stopped short when he saw the bathtub in the bathroom. WOW! he said again as he started jumping up and down. He absolutely knew what a bathtub was but judging by his reaction I don't think he's ever been in one. We hadn't even been in the hotel room 3 minutes, but Papa asked Do you want to take a bath? and indicated that he'd need to take his clothes off to get in. Ru didn't need to be asked twice and was naked in about 5 seconds flat. He jumped in the bath as quickly as possible and splashed and was giddy. He stood up and sat down and laid down in the water and flipped over on his tummy and repeated the whole cycle about 50 more times. I washed his chest and back and offered his a soap wash cloth for the rest of his body. Before I could blink he had grabbed the shower gel and squirted it all over his hair to wash his hair too. He mimics everything. Everything. He mostly has no idea what he's saying but it's cute as the dickens... and a little annoying to his siblings. So far the English words I think he understands and uses accurately are thank you, yes, no, mama and daddy, and some alphabet letters. Dinner was crazy amazing and just plain crazy. At the adoption office he said his favorite food was chicken when we got him. And at dinner he consumed about 20 chicken nuggets. And a banana. And a small cupcake. And pana cotta. And watermelon. Food he insisted he put on his plate but wouldn't eat included brie, dry parmesan cheese, canned corn and a glass or orange juice. Once back at the hotel room he got crazy excited when he saw the playing cards. We thought he wanted to play gin since he was organizing the cards in his hand that way! But soon discovered that he can play a mean game of Go Fish and he's quite the card shark! He's pretty stinkin' competitive and has no hesitation about cheating to win. He loves soda and candy but not cookies so much. For now he's pretty much getting all them he want's. That won't last forever, but for now it's okay. For right now we're letting him eat pretty much anything in the hotel room, like all the candy, soda, cookies and chips, figuring once it's gone we won't have to say no to it! Speaking of soda, how to pop the top off a soda can in a hot second. Speaking of pop tops, did you know China still has soda cans with pop tops? Who knew?! He is on and going a million miles a second. Not sure if that's his normal pace or if it's also from adrenaline and the excitement of the day and all the new things around him. He does know a tiny bit of English. He says Daddy. And he says thank you perfectly rand right at the right time too and unprompted. I also caught him saying under his breath saying "Nice to meet you" and "Have a nice day." He's been practicing. He doesn't mind sharing at all and eagerly offers his snacks to others. Knows how to clean up after himself. He tidied up his Legos. He wrote his ABC's at dinner last night. He got up to about K and then needed help to finish. He was listening to Mimi write a note and became a little embarrassed that he couldn't finish the alphabet by himself, but he was okay getting help from me on how to write the remaining letters. He was happy as a clam to go to bed tonight!